2017 Santa Fe, my first ever import. Calls for a 5w30 (or 20) ACEA A5 oil. Anyone have any suggestions for here in Ontario Canada? The Pennzoil Platinum 5W-30 sold here is an A5 oil. Valvoline SynPower 5W-30 is as well according to their website. Unless something's changed recently, they don't recommend XW-20 for the 2.0T here, only the 2.4. Last edited by wemay; 11/03/17 12:02 PM. I agree with wemay. I�m not sure if dexos gen 2 is available in Canada but any major brand of synthetic 5w-30 with that certification would be ideal. 0/40 really covers it all and doesn't cost any more. His warranty would be affected by using 0w-40. Do you have anything to back that up? We had a long discussion here a while back on the subject, and no one was able to point to an owner's manual statement or anything else that would indicate a warranty would be in jeopardy by using a different grade than what is recommended by the manufacturer. It's a statement that is often said and repeated here but there really isn't anything that would indicate it is close to true. If the owners manual says only 0W-20, then that's what you will have to use. If it gives you a range of oils you can use, then you can choose any one of them that meets your climate and financial needs. So there is just enough there to take what you'd like and form an opinion on the topic. 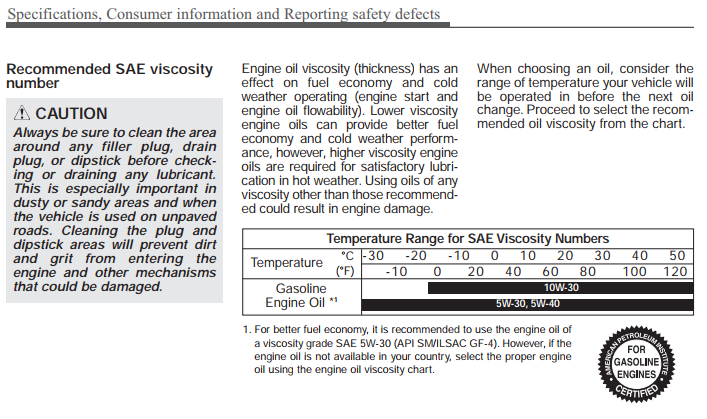 Read the owners manual then pick an oil that meets the specs. If you want some one to choose an oil for you Mobil 1 0W-40 or Castrol 0W-40. I have a case of Kendall 5w/30 GT1 Max synthetic, but it doesn't carry the A5 spec...would you use that anyway? Last edited by raggdoll; 11/03/17 02:30 PM. I have a 2011 Hyundai Sonata 2.0T. Now has 125K. Just got the report back from Blackstone. I am running Penngrade Select 5W-30 with no issues. I went 5,500 Miles on the last oil change. That is the longest I have ever gone on that 2.0T. The wear was excellent and they said I could go 7,500 Miles. I would use a good synthetic 5W-30 and change every 5-6K with a good Extended Oil Filter like WIX XP or FRAM or Hyundai OEM. You should have no issues. Just make sure it is a good synthetic oil. Kendall is a very good oil. But my concern is it does not carry the A5 spec, hence my question on using it? Last edited by raggdoll; 11/03/17 02:55 PM. Why is Hyundai still using temperature charts? Why not a mandatory single viscosity recommendation like all the other manufacturers do? 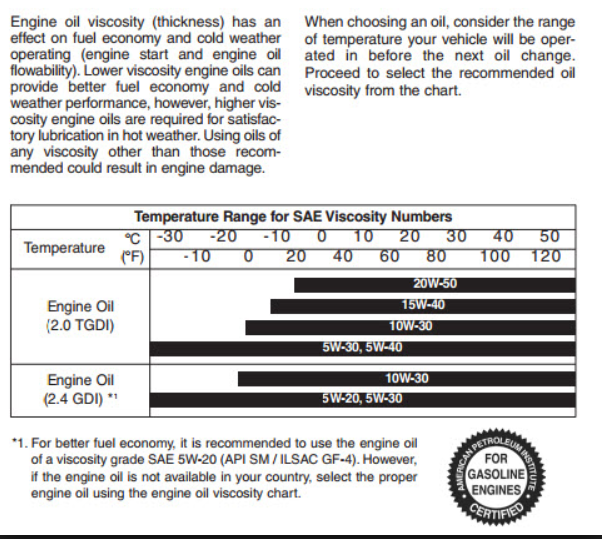 Temperature charts are confusing to the average car buyer. Yeah, but then they'd just say to use 5w20 in my Sonata!